At the same time the military skills are limited merely to the development of dexterity and physical strength and are found in certain skills that are appropriate in certain real situations here and now. The cult of military strength, belonging to a certain class or caste can play role of a tradition, that maintains and develops these skills. And military training was one of the criteria to belong to a definite class or caste. During a long-lasting break, when the military skills lose their everyday importance and, therefore, the necessity to maintain and develop them, they are replaced by another phenomenon that requires its own maintaining tradition. The brightest example of such replacement is the period in the history of Japan in the 16-17th centuries, when the long-lasting period of wars was over and there started a long period of peace. Within a rather short period of time a great number of weapon techniques schools were revived. Their founders, as a rule, had participated in real battles, and later had practice as wandering fencers, until in 1650 the fencing duels were banned. At the same time military skills were still essential among former Samurais, who became bodyguards or joined gangs that controlled gambling houses. Military skills, figuratively speaking, embodied in men, were looking for their place in a new life, to come back in full splendor and magnificence (changing their form and maintaining during the period of irrelevance) in the famous massacre in Ikedaya Inn in 1877 and other events at the end of the Edo period and the beginning of the Meiji period. There are no records of schools of martial arts and styles in Japanese annals and in military stories. The main military skill was archery, and the means of keeping it up was shooting at dogs on back of a galloping horse. Archery skills were a natural ability that went without saying, as well as a distinctive sign of a military aristocrat. It wasn’t a special skill or a special battle craft that one had to master. Only the physical ability to draw the tightest bow and to pierce the rider and the pommel of the saddle at a time were really astonishing. Marksmanship was not a separate skill, it was implied in the notion of shooting. Unlike in archery, a warrior who was found to show extraordinary skills of swords techniques was honoured with special comments by authors of military tales. At the same time only the records about warriors who grew up in Tsukushi (was located within Fukuoka Prefecture on Kyushu Island) and were famous as skillful sword fighters in the tale about the Hogen Rebellion can be recognized as the only evidence of a swordfighter training tradition or a swordfighter school ever. Also a Tsukushi inhabitant who lived at that time made records about Jiro Taifu Noritaka, the best sword fighter who taught some characters of the tale. Most likely the very first schools started appearing at the start of Sengoku Period, when Samurai archery contests and scarce sword fights were replaced by mass tactics armed with bows, spears and later firearms infantry. And they also were not schools of martial arts as we understand that nowadays, but cultivated and maintained individual military skills that were not so relevant in real battles any more. The ideas of succession and self-perfection appeared only when the skilled warriors stopped risking their lives every day, and their pupils had time and incentive to exchange this time for something ephemeral as to achieve ideal mastery and to find a way to themselves. In numerous Chinese chronicles before the 16th century there aren’t any reliable data to let us see that there used to be any schools of martial arts earlier that period. There is just little reference to some talented warriors who could be adherents of such schools, but that fact that it wasn’t accented by the authors of the chronicles on purpose as something worth commenting on, brings to the conclusion that military skills were cultivated in a professional environment rather than in martial arts schools. The Chinese novel of the 14th century “Water Margin”, where you can find a lot of references to martial art of individual warriors, gives the idea of such arts only as a skill at handling a certain weapon. The novel mentions some mentors of weapon application in troops or individual warriors, who mastered the skill of weapon application by themselves or were taught by other warriors with no tradition or succession at that time. The fact that the skill was passed from generation to generation is mentioned only two times. In the first case it refers to the skill of handling a “secret weapon” – a pike with a hook for drawing the enemy off the horse. The second case deserves our closer attention as it is about fisticuffs. Unfortunately, we can’t assume that it was a developed traditional Chinese art we are accustomed to nowadays. Most likely it was a usual popular fight with fists that sprang from the ancient world of fight and struggle. The illustrative example is the story of the military leader Qi Jiguang, the military reformer of the 16th century, who consolidated the known military skills and worked out the appropriate instructions that accelerated and became the cause of the transition from the cultivation of military skills to the origin of martial arts schools. The way of depicting positions and techniques of handling weapons in the form of people’s silhouettes that was used in Chinese (and later in Korean) treatises can maximally reveal only the technical part of the technique, that is part of a military skill, but it can’t pass the knowledge or the traditions of style of martial arts. Such treatises can claim to be just training regulations, manuals or instructions. It’s not right to relate the fighting traditions, that originated from rituals and religious traditions and that are considered to precede Chinese martial arts, to either military skills or to traditional schools of martial arts. It concerns any forms of aesthetic or decorative dancing kind as well. It’s possible that schools of martial arts existed and were essential in militia units that used to be in Chinese villages and have a long history. It is indirectly confirmed by the fact of typological resemblance of the surviving weapons of such militia units and the weapons of the famous schools of Chinese schools of martial arts. But anyway there is quite likely a difference between military skills that are practiced in a professional military circle and in a civil circle. A lot of witnesses, who watched physical exercises of soldiers of the regular Qin army many times, describe them exactly like exercises aimed at the development of dexterity and courage, though using the objects that are now considered the weapons of traditional martial arts. 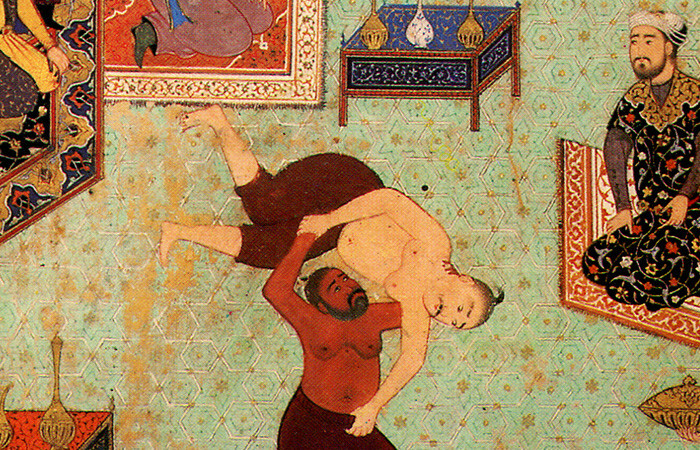 It’s remarkable for the Indian-Persian region that the traditions of wrestling, that originated in ancient times have survived into the present. This certainly can be explained by a peaceful and sports idea of the contents that could be easily used in real life practice, as most duels in the East including Japan, ended on the ground, in the ground fighting, and applying a knife or a dagger in the very end. Though travelers in India in the 1st part of the 19th century watched fisticuffs as well, it’s likely that this tradition appeared thanks to the influence of Englishmen, though such combats also ended on the ground. Unlike this tradition, the traditions of fighting with cold steel stopped their existence as the history didn’t need them any more, remaining in folk sports or dancing entertainments. The last and significant war in this region with cold steel was the Sipai revolt, where cold steel was equally applied by three forces according to the traditions of their country: the Hindu, the English and Hindus who fought with the English as part of the British troops (the native troops). After the revolt was put down the cultivation of native military skills just as they were was out of the question. Summing up one can state that in peacetime maintaining military skills get inefficient and useless, they turn into an art and exist in a somewhat ideal world of schools and styles, where the main focus is on aestheticism, coordination, the development of psychological skills and concentration. In wartime such arts must be as simple as possible to apply them in real war practice and battle craft. The fact what challenges certain military skills correspond to at a definite time period is also rather important. Nowadays when military skills are only applied either in a sports competition based on certain rules or in the street when you have to defend yourself with a knife against a knife, the best role of the old weapons techniques and styles in this case would be as a hobby. Only wrestling, the most ancient martial art that doesn’t have any national or geographical boundaries, is an everlasting skill that has been and will always be essential and appropriate.